The sheer number of Twitter applications available for the iPhone often makes choosing just one a very difficult choice for users. The official Twitter app is free of charge, but generally represents a love it or hate it situation amongst users with a large number of regular iOS Twitter users opting to look elsewhere for on-device Twitter usage. 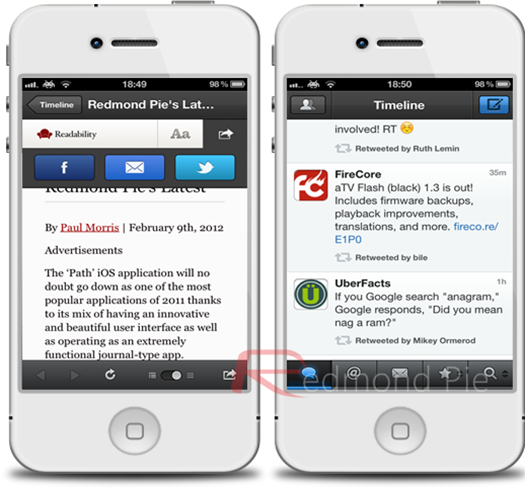 If you ask any seasoned iPhone user which Twitter application they prefer, the same handful of names generally pop up and usually includes the likes of Osfoora, Echofon, Twittelator Neue, Tweetbot and Twitterific. 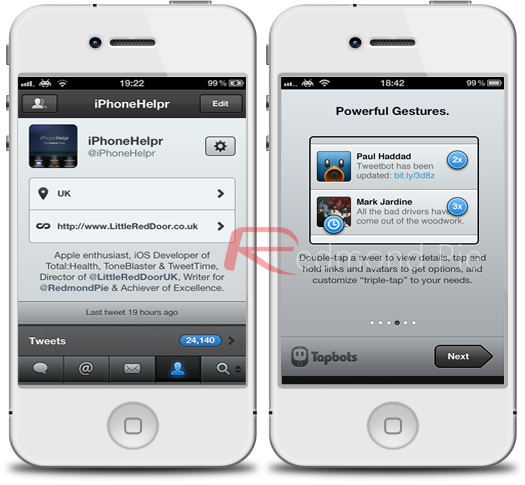 Out of those apps mentioned, Tweetbot by Tapbots seem to have gained the most critical acclaim and is widely considered to be an extremely polished and complete iPhone and iPod touch Twitter application. The developers have today taken the opportunity to push out their latest update for the Tweetbot application which takes it to version 2.0 and is available as a free of charge update to existing app owners. 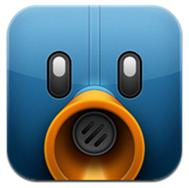 When Tweetbot was first launched on April 2011, it was regarded as a breath of fresh air due to the highly customized user interface, sound effects and the use of innovative gestures to activate certain features, but there were certain finishing touches missing from the app which held it back. The new direct messaging system offers a visual upgrade as well as a new streamlined view which makes reading DM conversations a lot easier and makes the private messaging side of things more like an instant message conversation which is how it should have always been in my opinion. The timeline and DM views also get a new automatic refresh feature which pulls in new tweets, mentions or messages every five minutes as long as the app is open and active. A new information bar is also present; when new tweets are available in your timeline it tells you how many new tweets have been pulled in and can be dismissed with a single tap. One of the previous problems with the earlier version of Tweetbot was the way the application handled links, which were embedded within tweets. Previously, to select a link the user had to click the tweet once to ‘activate’ it, and then select the link itself to actually redirect to the URL. This has been eradicated in version 2.0, with links new appearing in a highlighted blue color and can be activated with a single tap. The browser view, which opens up when selecting a link also got an overhaul with a new Readability option being integrated as well as social sharing options such as Facebook and Twitter. Although I can’t quite figure out why a Twitter sharing option would be needed which requires permission to be granted to share a link which has been opened through a Twitter client. A simple toggle has been integrated into the new browser which also formats any web page into a more readable text format, very similar to the ‘Reader’ feature in Mobile Safari. The whole application feels a whole lot smoother, and the speed improvements are immediately noticeable. One of the best feature added in today’s update in my opinion are the inline images, which show up in the timeline view, giving users a quick look at the image instead of having to tap a link to view in a separate window. A pet peeve of mine on most Twitter applications is also the fact that links and accounts which exist within user profiles are never selectable, which is something that has been rectified in Tweetbot 2.0 to my delight. The improvements in version 2.0 of Tweetbot definitely make the whole experience a much more pleasurable one, and whilst I would have previously been a little hesitant to use Tweetbot as my main iPhone Twitter app, version 2.0 has ensured that it is now my first choice.